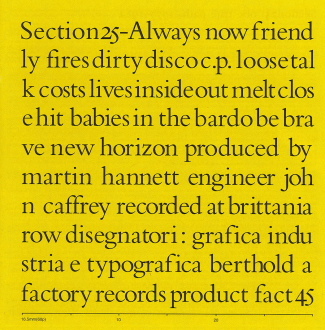 Expanded remaster of the acclaimed debut album by Section 25, originally released in 1981 on Factory Records (Fact 45) and produced by Martin Hannett at Pink Floyd's Britannia Row studio. Sleeved by Peter Saville in an exquisite pochette design, Always Now is as much an art installation as a long-playing record. This remaster includes 9 bonus tracks, including all tracks from the singles Girls Don't Count (Fac 18) and Haunted (FBN 3) as well as rare compilation album tracks and unreleased outtake Human Puppets. The re-modelled artwork faithfully reproduces the original Peter Saville sleeve construct as well as contemporary images of SXXV and detailed sleevenotes. In 2010 a deluxe 180 gram vinyl in a pochette sleeve was issued by US specialist label Drastic Plastic. Available on CD and download.